There is a lot of myth that surrounds The Jazz Singer and whether it deserves to hold such an important place in movie history. The fact that it got dropped from the AFI 100 in 2007 is in itself an indication. No, it wasn't the first picture to feature sound. And that often quoted line that supposedly kicked-off the talkies? It makes for a great story but it is not the first sound heard in the film. Yes, the plan was only to include the songs in the picture. 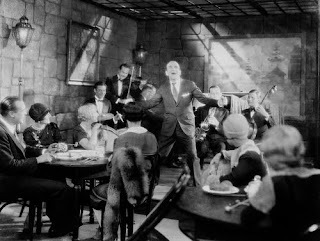 But, by ad-libbing between two numbers with his signature catch phrase Al Jolson managed to surprise his audience in a way that had never happened on such a scale before. What makes The Jazz Singer special is not anything that would put it in the Guinness Book of Records but more that it straggles a cinematic epoch with a foot in both worlds and as a result perfectly captures the birth of sound in motion pictures. Much of the movie is rooted firmly in the silent genre. As expected there are the title cards standing in for the spoken dialogue, but also the camera work and staging is freer in those silent scenes. The invention of sound would set back the art form by several years simply because of the technology needed to capture sound on set. Instead of the edit cuts there would be camera cuts, filming as in television with multiple cameras so as to maintain the continuity of sound. This in turn impacted the lighting and overall generally reduced the creativity that had been possible to that point. It is the moments in The Jazz Singer when we move from silent to sound and back that are therefore all the more striking. The whole picture changes and becomes more static visually in a way that is much more immediately evident than you could experience otherwise. If the whole film had been recorded with sound then it would not be as significant. Because of this it is difficult to find an analogy. Certainly it must have been pretty spectacular for an audience watching Méliès' A Trip To The Moon a quarter of a century earlier as the hand colored sections appeared on the screen, but it is not the same shift. Adding color did not affect the way the story was told, how the actors delivered their performances or how the shots were composed. Possibly the only close approximation is the advent of CGI and how it has freed filmmakers to show whatever they can imagine. It has also set moviemaking back at times as the focus becomes the effects and not the story. There are of course exceptions. But even this was more evolutionary than revolutionary. It took time and although there are real milestone films such as Jurassic Park, they cannot do what The Jazz Singer does. Their advances and innovations are only appreciated when viewed alongside their counterparts. The moment is much less evident within the film itself. Of course Spielberg still manages to get close by using his trademark slow reveal on the first dinosaur and then on the herds almost as if we the audience are as astounded as the scientists to see living, breathing dinosaurs for the first time. 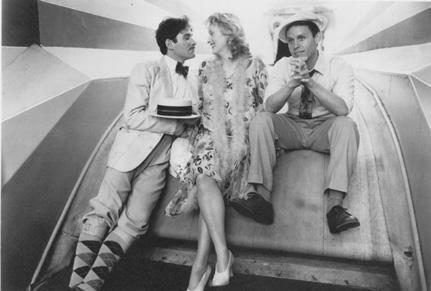 This then gets us back to the question of whether The Jazz Singer deserves the credit it has, its place in cinema history and its addition to the Library of Congress National Film Registry in 1996 (interestingly just 2 years before the first AFI list was assembled). This is not all nostalgia. Warner Brothers received an honorary oscar in 1929 "For producing The Jazz Singer, the pioneer outstanding talking picture, which has revolutionized the industry". Surprisingly as I mentioned up front it dropped off the AFI list in 2007 with Swing Time, the next in up in my queue, taking it place. All of its significance and gimmicks aside it is a damn good film and I can honestly say I really enjoyed it. It is simply a great story with a great cast. I won't delve too deeply into the face blacking scenes. Plenty has been written already and I urge you to view this with an open mind. Should it be considered offensive today? Of course. However I promise no spoilers so all I can say is that there is real significance to the act of blacking up in this story and the message it is trying to deliver is less about racism directed towards african americans and more about anti-semitism in the 1920s. I watched The Jazz Singer on DVD as there is no high definition version available and it truly looks much better than it has any right to do given its age. There is a three disc deluxe 80th anniversary edition which contains a lot of contemporary material that although only somewhat loosely related it is difficult to obtain these quirky and wonderful vaudeville shorts any other way and they make for a nice bonus. With all the myth and legend stripped away The Jazz Singer is still an exceptional movie and offers a rare glimpse into one of the most significant moments in the history of cinema. It is unquestionably Crucial Cinema. My Fair Lady was already a phenomenal success on broadway when Jack Warner purchased the rights to bring it to the big screen. Rex Harrison, Julie Andrews and Stanley Holloway had originated the key roles and were all keen to star in the film but the casting of the film would be anything but simple. Jack Warner had seen Harrison in Cleopatra and felt him too old to play the part of Higgins. Cary Grant turned down the role claiming that not only would he not do it but he would not even see the picture if Harrison was not cast. Holloway got the part after James Cagney pulled out at the last minute. Andrews was not as lucky. Harrison had pushed for her even though he had initially had problems with her grasp of the cockney accent in rehearsals for the stage production. Ironically he felt Hepburn would have even more trouble but she surprised everyone delivering an iconic performance and Harrison later referred to her as his favorite leading lady. Hepburn's performance did not even get an oscar nomination but is perhaps less surprising given the popularity of Andrews in the broadway production and Marni Nixon's dubbing of all of Hepburn's numbers on screen. Andrews actually got the Oscar that year for Mary Poppins just to add salt to the wound. Surpisingly Marni is american and also had to get her chops around the accent but she had already proven herself dubbing Deborah Kerr and Natalie Wood in West Side Story (only on "Tonight") and The King and I. Marni has spent most of her career off camera including Mulan's grandmother in 1998. Ironically she did get a small part in Andrews breakout film just a year later, a little picture called The Sound of Music. Jeremy Brett was brought in to make Hepburn seem younger. He was 30 at the time while Freddy is 20. He too suffered the fate of overdub, this time by another american Bill Shirley. The most striking thing about My Fair Lady is that the entire movie was filmed inside, specifically on a staggering 26 sound stages at Warner Brothers' Burbank studios. Coming on the back of the budget busting Cleopatra which was filmed on location in Rome, the decision was to keep the filming in Hollywood. All told it still became the most expensive Warner brothers film at that time coming in at $17m. There was absolutely no location filming, something that annoyed creator Alan Jay Lerner. The lack of any real exterior locations creates an interesting and almost claustrophobic stage set feel to the whole picture. This is particularly evident during the Ascot scenes which take on a surreal almost anachronistic quality making them more Logan's Run than Sound of Music. David Hall's choreography certainly adds to this and the result is perhaps more iconic than had it been filmed on location in the UK. George Cukor was already an established and respected director by the time he came to helm My Fair Lady. He had started on broadway and was especially skilled at bringing stage productions to the big screen. He did uncredited work on some of my all time favorite movies including Lust for Life, The Wizard of Oz and Gone With The Wind (which he was fired from). My Fair Lady swept the oscars in 1965. It garnered 12 nominations and won 8 including Harrison for best actor, Cecil Beaton's incredible costume design, Gene Allen's incredible sets, sound, music, cinematography and most importantly of all best picture. In what has become a good indicator of oscar success Cukor had gotten the DGA award earlier in the year and went on to take the oscar too. It was an interesting year at the oscars with competition from Mary Poppins, Zorba The Greek, Becket and Kubrick's masterpiece Dr. Strangelove. Seller's was also on screen and stealing most of the scenes in The Pink Panther which only received a music nomination. Another of my favorite movies managed a visual effects nomination and a honorary makeup award for William Tuttle, George Pal's superbly quirky 7 Faces of Dr. Lao. I had been holding off watching My Fair Lady as the blu ray was imminent and given the previous DVD restoration I had high expectations. The bad news is that this is not the hidef release everyone has been hoping and waiting for. 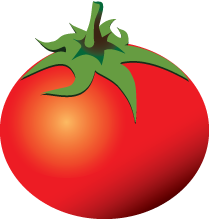 Robert Harris covers the topic in great detail over at the Home Theater Forum. The bottom line is that if you have the DVD you don't need to upgrade, if renting then the blu ray is a fine option. My experience supports that. The blu ray is definitely a disappointment but not terrible relative to movies of the same age. It is just that expectations are higher for film of this profile. The sixties was arguably the last decade of the great hollywood musical with the superb but commercial flop, Hello Dolly!, ushering in its end. Audiences of the seventies wanted gritty realism and even though there were some great musical pictures produced in that time including Grease, Jesus Christ Superstar and The Rocky Horror Picture Show, they were not from the same stable. If you don't like or don't get musicals then there is little I can do to change your mind except to say you are missing out on some of the greatest pictures ever made. Surprisingly My Fair Lady was dropped from the AFI 100 in 2007 having made position 91 back in 1998 and hence its low showing in my combined list. My Fair Lady is one of the greatest stage musicals ever produced, itself a musical adaptation of George Bernard Shaw’s Pygmalion, and a near perfect a big screen musical adaptation. It is unquestionably Crucial Cinema. The BFI 100 is full of these gritty, realistic portrayals of life in working class britain. Their place in the list comes from a real pride we have in our ability to get these these movies even made at all. They are virtually impossible in a hollywood system based solely on box office numbers. But their real value is that they capture a time and place in a way that no documentary really can and leave something truly valuable for future generations. Ken Loach is one of the master's of this kind of working class british cinema and he has two spots on the BFI list with both My Name Is Joe (#91) and one of the most acclaimed british films ever made, Kes (#7). He started in television with truly impact-full docudramas such as Cathy Come Home in 1964. He made Kes just five years later. I watched Kes for the first time in grammar school and until seeing My Name Is Joe it was the only Loach film I had ever seen. It had been sitting as the next movie in my list for a long time as I summoned up the willpower to sit through it. In the end I am glad I did. 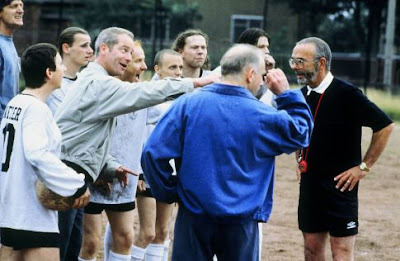 Peter Mullan delivers an incredible performance as the films central character and it earned him the award for best leading actor at the 1998 Cannes Film Festival. An even bigger achievement once you consider he was up against Roberto Benigni for Life Is Beautiful, for which Benigni won an Oscar. He had started with Loach on Riff-Raff in 1991 and had squeezed in Braveheart and Trainspotting before Joe. Louise Goodall had also worked with Loach before on Carla's Song and turns in a memorable performance here. David Hayman is a nice choice too. Much of the supporting cast were not professional actors and were effectively playing themselves, even to the point that the police disrupted a shoot as they recognized one of the actors from a previous offense. The casting and script (with all 200+ f-words) is what keeps Joe so grounded in reality and ultimately makes it a truly great film rather than the average one it could so easily have been. Joe is the second film that Paul Laverty and Ken Loach made together and they have been in constant collaboration since. I recently watched Bread & Roses which came just two years after Joe and is in itself a great movie, and the first foray into the US for Loach. They clearly work well together and Carla's Song and Sweet Sixteen are definitely on my to watch list. Getting a copy to watch here in the US is unsurprisingly difficult. The only place I could find it in the end was via Amazon Instant Video and then only for purchase (the rental option conveniently disappeared just weeks before I bit the bullet and decided to watch it). The quality is good enough for the source material and with no other release in sight is really your only option. As with Trainspotting I have read Joe is often shown in the US with subtitles due to the strong Glaswegian accents. Hard to imagine needing them to be honest but something to think about if you don't know what PBS is. Joe is not a feel good movie with a Hollywood ending and that may be the best reason to force yourself to watch it. Great filmmaking is about making an emotional connection with your audience and leaving them with something to think about other than where they parked the car. 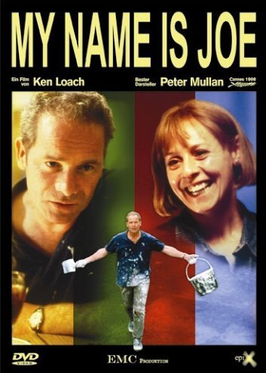 My Name Is Joe delivers on all of that and more and is without doubt Crucial Cinema. Sophie’s Choice was added to the AFI Top 100 in 2007 and after finally seeing it I can honestly say it’s absence from the original 1998 list was a injustice that has now been thankfully righted. As with many films I have watched so far from the AFI list, in both the viewing and the subsequent research I was a little embarrassed to admit I had never seen it. I was a fan of Pakula’s other films, especially All The President’s Men and The Pelican Brief, and had no idea he had not only directed Sophie’s Choice but adapted the screenplay also. Add to that the fact that it contains the strongest and earliest performances of three great actors, you cannot blame me for wondering why I hadn’t noticed the rock that I had obviously been living under for the last couple of decades. If you have never seen the film, read William Styron’s book or heard about the choice that is at the center of the movie then stop reading and go watch it. Its as simple as that. If you need more convincing then read on. There are many reasons that this film is on the AFI list, not least of which is the acting. Pakula understands his actors and he has directed eight of them in Oscar-nominated performances: Jane Fonda, Liza Minnelli, Jason Robards, Jane Alexander, Richard Farnsworth, Jill Clayburgh, Candice Bergen and Meryl Streep. Three of them, Fonda, Robards and Streep, took one home, Streep’s for this picture. Her performance is simply astounding. Kline, in his first film role, is simply brilliant and Cleese cast him in A Fish Called Wanda based on this performance. I also came away with a new found respect for MacNicol. I have always thought of him as an average actor but what he delivers here makes him great. Sophie’s Choice may have gotten Streep her Oscar but there was no nomination for the picture itself. It did receive nominations but no wins for cinematography, costume, music and screenplay. In 1983 it was up against some stiff competition to be fair: Gandhi, ET, Tootsie, An Office and a Gentleman, Das Boot and The Verdict. Plus some other great films but not so much Oscar competition including Tron, Poltergeist and a little film called Blade Runner. It’s not all perfect. The pace is almost unbearably slow at times and you might be tempted to bail early. I highly recommend you don’t. As the story progresses you come to appreciate the time that was taken earlier on. If you have to watch it in a couple of sittings, but definitely finish it. I watched the US DVD release of Sophie’s Choice as right now there is little alternative. The quality was as you would expect for an early eighties film which has seen little to no remastering. The picture quality, mostly overly soft, varies throughout and a good remaster and blu ray release is definitely required for such a classic film. 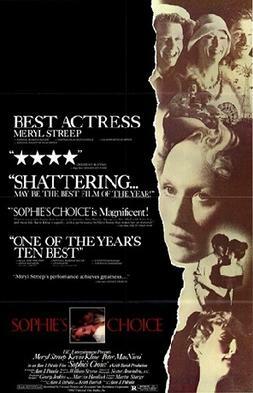 Sophie’s Choice is hands down Crucial Cinema. Theodore Dreiser’s parable on the myth of the American dream was published in 1925 and first commited to celluloid in 1931 with the same title. When George Stevens approached Paramount with the idea of filming another adaptation they were less than excited about a remake so soon after the original. It’s funny to think of 20 years as once being considered too soon for a remake in Hollywood. Stevens sued them for breach of contract and they finally let him make it and thank god they did. A Place In The Sun is as much a masterpiece of American cinema as the book is a classic of American literature. Those new to the blog may not know that I detest reviews of films that give away the plot. The best way to see a movie is when you know absolutely nothing about it. Even the trailer can be too much. My goal is to get you to watch the picture and hopefully I occasionally succeed. A Place In The Sun is just one of those pictures. The less you know the better it will be. What I can talk about is the cast. In 1949 Elizabeth Taylor was just 17 and her leading man, Montgomery Clift, was just shy of 30. A great child actor she had done little to suggest what she was capable of here and the studio took a risk that paid off and launched her career as a Hollywood icon. Shelley Winters had only played glamorous roles and taking this part in 1951 must have took incredible courage. The result is simply incredible, a film that is as good today as the day it was made. The film took home 6 oscars for Best Cinematography, Costume Design, Direction, Film Editing, Music and Screenplay. Clift and Winter both got nominations as did the production itself for Best Picture. Impressive considering there was some serious competition that year from An American in Paris, Quo Vadis, A Streetcar Named Desire, the African Queen and Death of a Salesman. It is a little surprising then that the AFI dropped it from their revised Top 100 in 2007 and that Rotten Tomatoes has it at a paltry 75%. The book is far better as usually the case, and the film is much lighter more melodramatic than its 1931 predecessor. Some critics feel it is now dated and that is most likely why it was dropped. I personally feel it has held up extremely well and is in my books at least, Crucial Cinema.